Northiam 75 upset higher grade opposition to become the first team through to the final of the Macron East Sussex Football League’s flagship knockout competition. The Division One leaders booked their place in the Premier Travel Challenge Cup decider after pulling off a splendid 3-0 semi-final win away to Premier Division side Sidley United. Sidley United and Northiam 75 scrap for possession. Scott Embery gave Northiam a half time lead, and second half strikes by Stephen Housago and Embery again sealed Sidley’s fate. Northiam will have to wait a while to discover who they will meet in the final as the top half of the draw is some way behind. The quarter-final between Rye Town and Bexhill AAC was postponed and has since been rearranged for Saturday March 31. The winners will play Hollington United. AAC, incidentally, still have nine Division One matches remaining and they are due to be in cup action for the next three Saturdays. Northiam 75 in possession during their 3-0 victory over Sidley United. Despite the wet weather, 15 league and cup matches were played on Saturday, and two others were decided by way of walkovers. Division Two leaders Icklesham Casuals powered into the final of the Wisdens Sports Challenge Cup on the back of a 9-1 win against Division Three outfit Catsfield in a match moved to Tilekiln. Charlie Cornford netted a hat-trick, Steffan Davies and Jack Hobden bagged two each, and there was one apiece for Sean Baker and Kieran Dighton. Adam Barham nabbed Catsfield’s consolation. In the bottom half of the draw, Division Two high-flyers Sovereign Saints reached the semi-finals via a 2-1 success away to Sedlescombe Rangers II, who lie second in Division Three. Sidley United and Northiam 75 battle it out at Hooe Recreation Ground. 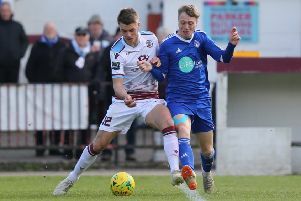 Liam Baker scored for Sedlescombe in a tie moved to Bexhill Road, but it wasn’t quite enough to prevent Saints setting up a last four clash at home to another Division Three team in the form of Victoria Baptists. George Sambrook and Philip Broom struck for Saints. Division Four pacesetters Orington secured their place in the Coopers Construction Challenge Cup final by winning 6-3 in a thrilling semi-final at home to Cranbrook Town. Orington will also have to wait a while to find out their final opponents because South Coast Athletico and Robertsbridge United II are yet to play their quarter-final, although it’s been rescheduled for this coming Saturday. The winners of that will entertain Hampden Park in the semi-finals. As for the league action, Premier Division top dogs Battle Baptists made it six wins out of six in all competitions since the turn of the year with a 5-3 success at home to Robertsbridge United. Sidley United midfielder Sam Thompson plays the ball forward. In a match moved to Bexhill Road, two goals apiece from strike partners Josh Pickering and Adam Staplehurst, and one from Dale Vinall, gave Battle an 11th win in 13 league games this term. Chris Phillips, Philip Green and Paul Barnes netted for a Robertsbridge side which moved up a place to sixth despite losing. Battle remain two points clear of second-placed Hollington United, albeit having played a game more, after Hollington received a walkover with scheduled hosts Ore Athletic unable to field a team. Sedlescombe Rangers achieved comfortably their biggest win of the season with a superb 7-0 victory away to a Bexhill Town side which had a player sent-off. Michael Booth plundered a four-goal salvo, and there was one apiece for Aidan Aspinall, Philip Hatch and Luke Graham Davies as eighth-placed Sedlescombe moved within one position and one point of their victims having played three less matches. Wadhurst United climbed to second in Division One courtesy of a narrow 1-0 win at home to Westfield II, who were second at kick-off. Oliver Vidler netted the only goal. Sidley United and Northiam 75 compete for possession. Just four points separate Wadhurst and seventh-placed The JC Tackleway so it’s very much all to play for over the remaining month-and-a-half or so of the season. There was also just one game played in Division Two and St Leonards Social II jumped up two places to fourth via a 4-1 triumph at home to bottom side Bexhill Rovers. Casey Ham was on target for Rovers. Punnetts Town became the first league champions of the season after clinching the Division Three title with four games to spare. Punnetts made it 14 league wins out of 14 without even kicking a ball as scheduled hosts Pebsham Sibex failed to raise a side. Sandhurst, who have just one league game to go, crept above Sibex into the top three by drawing 2-2 away to seventh-placed Victoria Baptists. The goals of Jason Baldock and Andrew Turner for Sandhurst were matched by Joe Bellett and Lawrence Green for Victoria. Bexhill Broncos matched Icklesham as the day’s biggest winners with a 9-1 victory at home to Sovereign Saints II in Division Four. Matthew Stephens led the way with a hat-trick, James Downs and Jack Hickman scored two each, and Andy Darby and Jack Harman got the others. Chris Williams provided the lone response. Third-placed Broncos are now just three points off the top and possess the division’s best goal difference, but have played more matches than leaders Orington and second-placed Bexhill AAC II. Division Four’s other game also yielded 10 goals as fourth-placed South Coast Athletico prevailed 7-3 away to second-bottom Parkfield. Mike Hawley bagged a hat-trick for Athletico, whose other scorers were Connor Easton (2), Ryan Wright and Jack Bloomfield. Oliver Truman (2) and Adam Robinson replied. Four matches were played in Division Five and there was no change at the top as the leading two sides both won. Top dogs Sedlescombe Rangers III scored two late goals to prevail 2-1 at home to Wittersham II. Stephen Davey equalised from the penalty spot and Kit Harris rifled into the top corner for a superb winner. Second-placed Hampden Park remain five points behind Sedlescombe with three games in hand after winning 7-0 away to bottom-of-the-table Beckley Rangers. William Coles, Craig Crowther, Eddie Dunn, Tobias Ekroth Smith, Daniel Weston, Darren Weller and Carl Barnes grabbed the goals. Third-placed Battle Baptists III won 3-2 away to Herstmonceux II to stay two points behind Hampden Park having played four more fixtures. The goals of Jamie Crouch (2) and Matthew Ward were just enough for Battle to overcome a Herstmonceux team for whom Artur Mendes and Curtis Eyres found the net. Northiam 75 II and AFC Hollington played out a 2-2 draw, with Kieron Moss and Paul Brooker on target for Northiam, and Harry Kidd and Michael Taylor for Hollington. Matches are scheduled for this Saturday across five of the six divisions, plus various cup competitions as the league frantically seeks to get the quarter-finals and semi-finals completed. There’s also a Division Two fixture next Tuesday night as Bexhill United II host Sovereign Saints.